THIS WEB SITE, “MUATHE.COM” IS OWNED AND OPERATED BY ENCARE FINANCIAL INC. PERSONAL AND NON-COMMERCIAL USE LIMITATION This Web site is for user's personal and non-commercial use. User may not modify, copy, distribute, transmit, display, perform, reproduce, publish, license, create derivative works from, transfer, or sell any information, software, products or services obtained from this Web site. You may save data and charts to your hard drive or other storage media, and you may print out onto paper, and manipulate them in any way you like, provided that you do so for your own use, and do not distribute the charts or data to others. NATURE OF SERVICE Muathe.com is a publisher and publishes analyses and reports by providing information on selected companies that Muathe.com believes are of interest to investors. Muathe.com, its founders, website owner and affiliates are NOT registered investment advisors or broker-dealers. Muathe.com IS NOT A MEMBER OF THE NASD OR ANY OTHER UNITED STATES SECURITIES REGULATORY INSTITUTION AND MAKES NO CLAIMS AS SUCH and do not purport to tell people, or suggest to people, what they should buy or sell stocks for themselves, nor do they recommend any specific approach to investing in securities. All stock, futures and options trading involve risk. You must decide your own suitability to trade and manage risk. The statements, opinions and analyses presented on the Muathe.com website or newsletters is provided as an information and education service only and are not intended as investment advice. Muathe.com does not provide investment advice or counseling. The analyses, statements and opinions on the Muathe.com website, emails or newsletters should not be construed as an offer or solicitation to buy or sell any security of any kind. Past performance does not indicate future results. Investors should always check with their licensed financial advisor, including their tax advisor, to determine the suitability of any investment. Muathe.com recommends that anyone trading securities should do so with caution and prior to the execution of a security trade based upon information from Muathe.com, users are advised to consult with their broker or other financial representative. Neither Muathe.com nor anyone associated or affiliated with Muathe.com is responsible for any investment decision made. It should be understood that past performance might not be indicative of future performance. There is a risk of loss in all trading. Muathe.com, its founders, editors, or affiliates, shall not be liable for any losses or damages, monetary or otherwise that result from the use, reliance or content of its website and/or newsletters. SUBSCRIPTIONS, PAYMENT AND MESSAGE BOARD USE [INCLUDES REFUND POLICY]: Subscribers to Muathe.com membership site may subscribe to: a monthly (30 days) period, six– months period or annual (360 days) subscription period. Payment is due in advance. WHERE APPLICABLE MUATHE.COM NOW OFFERS A TWO-WEEK MONEY BACK GUARANTEE PERIOD. THIS TWO-WEEK MONEY BACK GUARANTEE PERIOD CAN ONLY BE USED ONCE FOR EACH PERSON/ACCOUNT. ABUSE OF OUR TWO-WEEK MONEY BACK GUARANTEE PERIOD WILL RESULT TO NO REFUND ISSUED. CANCEL AT ANY TIME DURING THIS PERIOD AND YOU WILL GET YOUR MONEY BACK INSTANTLY, WITH NO HASSLES, NO QUESTIONS. AFTER THE TWO-WEEK PERIOD THERE WILL BE NO REFUNDS OF ANY KIND, AND SHOULD YOU CANCEL THE NEXT BILLING YOUR ACCOUNT WILL EXPIRE AUTOMATICALLY WITH NO FURTHER CHARGE AT THE ANNIVERSARY DATE OF YOUR LATEST ANNUAL SUBSCRIPTION PAYMENT. THERE IS NO TWO-WEEK MONEY BACK GUARANTEE PERIOD FOR REPEAT CLIENTS, AND/OR THOSE WHO HAVE ALREADY PREVIOUSLY TAKEN ADVANTAGE OF THE TWO-WEEK "TRIAL" PERIOD BEFORE. THIS IS IN AN EFFORT TO REDUCE ABUSE OF OUR TWO-WEEK MONEY BACK GUARANTEE PERIOD - WHICH IS ONLY OFFERED TO NEW - FIRST TIME - CLIENTS. CANCELLATION Muathe.com reserves the right at it’s discretion to deny any user access to this website or any portion thereof without notice. All cancellations of a subscription service must be received in writing as per the deadlines indicated; , email (send your emails to "eric @ Muathe. com" - one word with no spaces), phone and regular mail notifications are acceptable. ACCURACY OF INFORMATION Information presented by Muathe.com is from sources Muathe.com believes are reliable. However, Muathe.com has not independently verified such information. 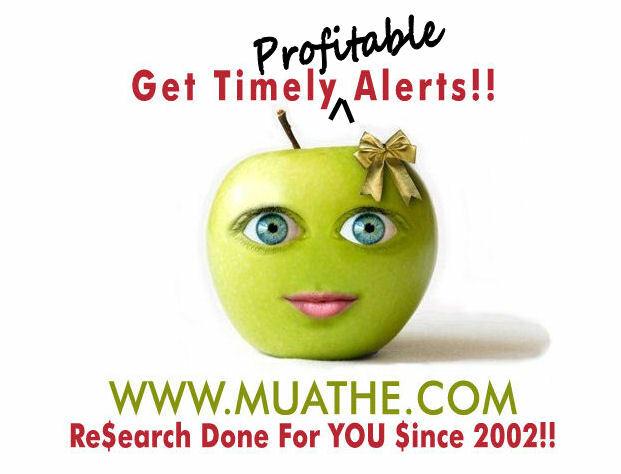 Muathe.com uses reliable methods to obtain its signals but cannot be guaranteed for correctness, accuracy, reliability, profit or otherwise, does not warrant the information provided nor make any guarantees on performance. The Muathe.com website, emails or newsletters, contains forward-looking statements, which involve risks, and uncertainties that may cause actual results to differ materially from those set forth in the forward-looking statements. No representation is made that any account will, or is likely to achieve profits or losses similar to those shown. DISCLAIMER OF WARRANTIES AND LIMITATION OF LIABILITY 1. USER EXPRESSLY AGREES THAT USE OF THE FORUMS AND THIS WEB SITE ARE AT HIS OR HER SOLE RISK. NEITHER MUATHE.COM ITS AFFILIATES, NOR ANY OF THEIR RESPECTIVE EMPLOYEES, AGENTS, THIRD-PARTY CONTENT PROVIDERS, OR LICENSORS WARRANTS THAT USE OF THIS WEB SITE WILL BE UNINTERRUPTED OR ERROR FREE; NOR DO THEY MAKE ANY WARRANTY AS TO THE RESULTS THAT MAY BE OBTAINED FROM USE OF THIS WEB SITE OR AS TO THE ACCURACY, RELIABILITY, OR CONTENT OF ANY INFORMATION, SERVICE, OR MERCHANDISE PROVIDED THROUGH THIS WEB SITE. 2. THIS WEB SITE PROVIDED ON AN "AS IS" BASIS WITHOUT WARRANTIES OF ANY KIND, EITHER EXPRESS OR IMPLIED, INCLUDING BUT NOT LIMITED TO WARRANTIES OF TITLE OR IMPLIED WARRANTIES OF MERCHANTABILITY OR FITNESS FOR A PARTICULAR PURPOSE, OTHER THAN THOSE WARRANTIES WHICH ARE IMPLIED BY AND INCAPABLE OF EXCLUSION, RESTRICTION, OR MODIFICATION UNDER THE LAWS APPLICABLE TO THIS AGREEMENT. 3. THE DISCLAIMERS OF LIABILITY CONTAINED IN THIS SECTION APPLY TO ANY DAMAGES OR INJURY CAUSED BY ANY FAILURE OF PERFORMANCE, ERROR, OMISSION, INTERRUPTION, DELETION, DEFECT, DELAY IN OPERATION OR TRANSMISSION, COMPUTER VIRUS, COMMUNICATION LINE FAILURE, THEFT OR DESTRUCTION OR UNAUTHORIZED ACCESS TO, ALTERATION OF, OR USE OF RECORD, WHETHER FOR BREACH OF CONTRACT, TORTUOUS BEHAVIOUR, NEGLIGENCE, OR UNDER ANY OTHER CAUSE OF ACTION. USER SPECIFICALLY ACKNOWLEDGES THAT MUATHE.COM IS NOT LIABLE FOR THE DEFAMATORY, OFFENSIVE, OR ILLEGAL CONDUCT OF OTHER THIRD PARTIES, MEMBERS, OR OTHER USERS AND THAT THE RISK OF INJURY FROM THE FORGOING RESTS ENTIRELY WITH EACH MEMBER. 4. IN NO EVENT WILL MUATHE.COM OR ANY PERSON OR ENTITY INVOLVED IN CREATING, PRODUCING, OR DISTRIBUTING THIS WEB SITE BE LIABLE FOR ANY DIRECT, INDIRECT, INCIDENTAL, SPECIAL, OR CONSEQUENTIAL DAMAGES (INCLUDING BUT NOT LIMITED TO LOST PROFITS OR TRADING LOSSES) ARISING OUT OF THE USE OF OR INABILITY TO USE THIS WEB SITE OR OUT OF THE BREACH OF ANY WARRANTY. USER HEREBY ACKNOWLEDGES THAT THE PROVISIONS OF THIS SECTION SHALL APPLY TO ALL CONTENT ON THIS WEB SITE. 5. MUATHE.COM DOES NOT ENDORSE, WARRANT, OR GUARANTEE ANY PRODUCT OR SERVICE OFFERED BY A THIRD PARTY THROUGH THIS WEB SITE AND WILL NOT BE A PARTY TO OR IN ANY WAY MONITOR ANY TRANSACTION BETWEEN USER AND THIRD-PARTY PROVIDERS OF PRODUCTS OR SERVICES. AS WITH THE PURCHASE OF A PRODUCT OR SERVICE THROUGH ANY MEDIUM OR IN ANY ENVIRONMENT, USER SHOULD USE HIS OR HER BEST JUDGMENT AND EXERCISE CAUTION WHERE APPROPRIATE. 6. USER AGREES THAT THE LIABILITY OF MUATHE.COM, ITS AFFILIATES, AGENTS, AND LICENSORS, IF ANY, ARISING OUT OF ANY KIND OF LEGAL CLAIM (WHETHER IN CONTRACT, TORT, OR OTHERWISE) IN ANY WAY CONNECTED WITH THIS WEB SITE OR THE INFORMATION IN THIS WEB SITE SHALL NOT EXCEED THE AMOUNT USER PAID TO MUATHE.COM, FOR USE OF THIS WEB SITE. BECAUSE SOME STATES/JURISDICTIONS DO NOT ALLOW THE EXCLUSION OR LIMITATION OF LIABILITY FOR CONSEQUENTIAL OR INCIDENTAL DAMAGES, THE ABOVE LIMITATION MAY NOT APPLY TO USER. INDEMNIFICATION User agrees to indemnify and hold Muathe.com, its founders or site owners, its employees, its officers, and its agents harmless from and against any and all claims, damages, obligations, losses, liabilities, costs or debt, and expenses (including but not limited to attorney's fees) arising from user's use of this Web site or from user's violation of this Agreement or any third party's rights including but not limited to copyright, property, and privacy rights. This indemnification and hold harmless obligation will survive this Agreement and user use of this Web site. LINKS TO THIRD-PARTY SITES This Web site contains hyperlinks to other Web sites operated by parties other than Muathe.com, and other resources and advertisers. Such hyperlinks are provided for user's reference only. Muathe.com is not responsible for the availability of these external sites nor is it responsible for any of the contents, advertising, products, or other materials on such external sites. Muathe.com's inclusion of hyperlinks to such Web sites does not imply any endorsement of the material on such Web sites or any association with their operators. Under no circumstances shall Muathe.com be held responsible or liable, directly or indirectly, for any loss or damage caused or alleged to have been caused in connection with the use of or reliance on any content, goods, or services available on such external site. Any concerns regarding any external link should be directed to its respective site administrator or webmaster. TERMINATION This Agreement shall remain effective until terminated in accordance with its terms. Muathe.com may terminate this Agreement, and/or your access to and use of any Muathe.com products, immediately, in the event we determine, in our sole discretion, that you have breached this Agreement. In this case you will not be reimbursed or refunded for the unused portion of your subscription. In addition, we reserve the right, upon 10-business days notice and the reimbursement of any whole months remaining on your subscription, to terminate this Agreement without cause. COPYRIGHT NOTICE. Except where indicated, all content on this site is Copyright © 2001-2006 by Muathe.com. A division of Encare Financial Services, Kansas City Missouri. All rights reserved. No charts and analyses or other content of Muathe.com web site can be made public by users without written consent of Muathe.com. CONFIDENTIALITY WARNING Absent the use of encryption, the Internet is not a secured medium and privacy cannot be ensured. Internet e-mail is vulnerable to interception and forging. Muathe.com will not be responsible for any damages you or any third party may suffer as a result of the transmission of confidential information that you may make to Muathe.com through the Internet, or that you expressly or implicitly authorize Muathe.com to make, or for any errors or any changes made to any transmitted information. COMPUTER VIRUSES While efforts are made to ensure that the Information provided at this Site does not contain computer viruses, you should take reasonable and appropriate precautions to scan for computer viruses and should ensure that you have a complete and current back up of the applicable items of information contained on your computer system. PRIVACY Personal data provided by each user to Muathe.com will be used only in connection with services provided on this Web site and will not be given to others. CONFORMANCE WITH LAW You agree that your use of this Site will not violate any applicable local, national or international law, including but not limited to any regulations having the force of law. Some jurisdictions may have restrictions on the use of the Internet by their residents. You agree not to impersonate any person in your use of the Site or the sending of any e-mail to an address listed on the Site. SEVERABILITY If any part of this Agreement is determined to be invalid or unenforceable pursuant to applicable law including, but not limited to, the warranty disclaimers and liability limitations set forth above, then the invalid or unenforceable provision will be deemed superseded by a valid, enforceable provision that most closely matches the intent of the original provision and the remainder of the Agreement shall continue in effect. INCAPACITATION, OR UPON DEATH: SHOULD ERIC M. MUATHE DIE UNEXPECTEDLY, BECOME INCAPACITATED IN ANYWAY, OR IS UNABLE TO OFFER SERVICES FOR UNFORESEEN EXTREME CIRCUMSTANCES, AND THE SERVICE STOPS ABRUPTLY THERE WILL BE NO REFUNDS WHATSOEVER. UNFORTUNATELY, THIS IS ONE OF THE INHERENT RISKS OF SERVICES OFFERED BY AN INDIVIDUAL - THE POSSIBILITY OF INCAPACITATION. BY AGREEING TO PAY FOR, AND USE, THIS SITE YOU AGREE TO THIS INCAPACITATION CLAUSE AS PART OF THE TERMS OF SERVICE. 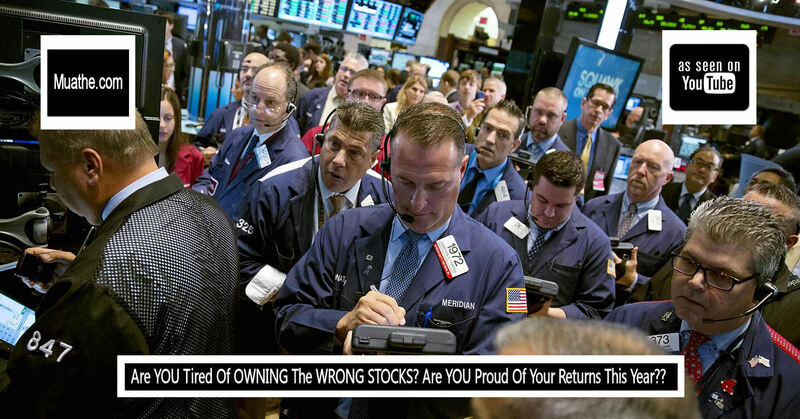 Are YOU Tired Of OWNING The WRONG STOCKS, COMMODITIES, ETFs? Are YOU Proud Of Your Returns This Year??? Are YOU Struggling To Make Money In The Stock, Commodity, and Cryptocurrency Markets??? Are YOU Constantly Missing Out On Profitable Explosive Market Winners?? ?